Identification: Forewing is dark gray with a blue tint. 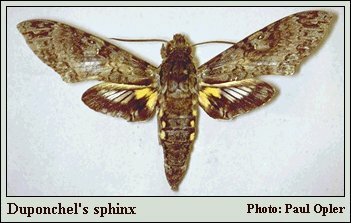 Hindwing is black with a deeply divided yellow patch at the base, and a translucent area that ends sharply at the black margin. Life History: Caterpillars are large and have a horn at their rear end. Flight: . Throughout the year. Caterpillar Hosts: Custard apple (Annona glabra) and other members of the Annonaceae family. Range: Southern Brazil north through Mexico and the West Indies; rare in Florida and Texas. Conservation: Not required for a tropical stray.